Description This 2007 Chrysler Pacifica Touring is offered to you for sale by Matt Bowers Chevrolet. There are many vehicles on the market but if you are looking for a vehicle that will perform as good as it looks then this Chrysler Pacifica Touring is the one! This vehicle won't last long, take it home today. Driven by many, but adored by more, the Chrysler Pacifica Touring is a perfect addition to any home. 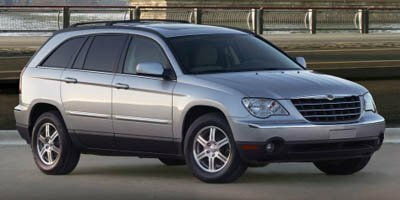 More information about the 2007 Chrysler Pacifica: A powerful new 4.0L V6 engine and six-speed transmission give the 2007 Chrysler Pacifica gutsy acceleration and luxurious cruising ability. The optional third-row folding seat allows eight adults to ride comfortably. With the third row folded, up to 45 cubic feet of cargo fits into the back. The Pacifica does a nice job of combining SUV capacity with car-like posture and minivan highway comfort. No other vehicle in its segment can compete for cargo space, and none offer seating for eight adults. This model sets itself apart with All-wheel drive available, three rows of seating, generous cargo room, and SUV capacity with car-like ride and handling. Lifetime warranty is a limited Powertrain Warranty. Owner must follow manufacturers recommended maintenance on new vehicles as per owners manual. Covers select pre-owned vehicles five calendar years old or newer, with 80,000 miles or less. Other restrictions apply. See dealer for warranty details.